Home > Equipment > Should You Have Ski Lessons Before Your Ski Holiday? When you watch people skiing on TV it all looks so easy, so the lure of a ski holiday where you get to try it out for yourself is very strong. Sadly, there’s a reason why professional skiers get paid so handsomely for their efforts, it’s actually really hard work! I’m Going on a Winter Sports Holiday – Should I have Ski Lessons? Well, that all depends on whether you’ve tried it before, what your general balance is like, and whether you intend to get into skiing as a sport or just tinker with it once on holiday. Skiing can be hard work, and before you go, you need to get some general fitness training in as well as some specific balance training. 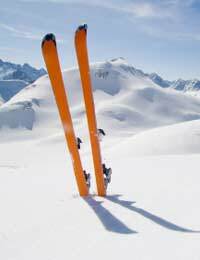 If you don’t have well trained core stability (the abdominal ‘core’ muscles are the ones you use to keep you upright and support your back) you are likely to come a cropper trying to stand up straight while careering downhill on a set of skis or a snowboard! Specific ski lesions are a good idea before you go on a skiing holiday, especially if you are a complete beginner and going with other people who know what they are doing. The worst thing that you can do is to assume that they will help you, because in reality what will happen is that they will try and give you a few pointers and then leave you on the nursery slopes with the eight year olds while they zoom off all over the place. Or worse still, they will try and get you to go with them on the harder slopes and you’ll come a cropper! Where Can I Get Ski Lessons? You could try a dry ski slope before you go, and see if you can have a few training sessions there where it’s relatively safe, there are likely to be less people, and there will be lessons available. It also helps you get a feel for skis – they aren’t the easiest footwear to get the hang of and it’s better to get used to them before you venture out onto the snow! Ski lessons on dry ski slopes are relatively cheap and so it’s worth planning a few in advance of your holiday. There are dry ski slopes all over the country as the popularity of winter sports and ski holidays is increasing and the demand for a bit of pre-holiday training is getting higher! When you get out onto the slopes, it’s best to start your holiday with a few professional lessons actually on the snow. Even if you’ve mastered the art on the dry slopes, the feel of the snow is likely to be quite different so before you set off on an adventure, just acclimatise yourself. Most resorts have professional ski lessons on offer and it will set you in good stead for when you’re let loose on your own!